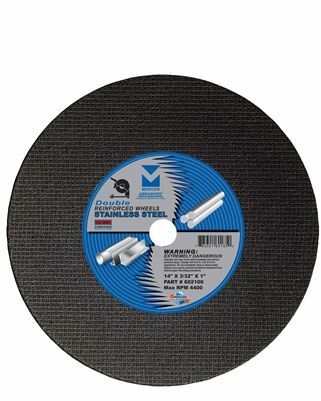 Chop Saw Wheel - Cut-Off Wheel - 14" x 3/32" x 1"
Heat-Treated Aluminum Oxide grain for cutting all metals including stainless steel and non-ferrous metals. Double reinforced for extended wheel life. Extra thin design for high-efficiency, burr-free cutting. Designed for less wear on chop saws and less operator fatigue. Mercer’s Cut-off wheels are for heavy-duty cut-off jobs and feature a thin design for cleaning and slotting. They ensure optimum effectiveness for dry applications on a broad range of non-ferrous, masonry, and other materials.